Okay. You know what's wrong with the world, I know what's wrong with the world - why don't we come out and talk about it? It's the reason why cotton candy never tastes as good as you remember. It's the reason why my country is now being run by a factory reject mannequin. It's at the heart of every wrong thing ever, the fault at the foundation of the cosmos. We don't have enough cool contests. Sure, we've got lotteries. We've got raffles. We've got competitions, pageants, auditions, sweepstakes, showdowns, death matches, celebrity smack-downs. We've got a healthy competitive ethos distilled in pure isopropyl hope. But cool contests? No. Holy crap! you says. Is that the obverse of the previous image? I says yes. 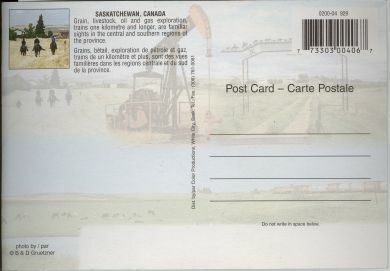 I says that I own a postcard that proclaims "I am happy in Saskatchewan". But why should I go around owning such a postcard when you can own it? With a very personalized message from me? 1. 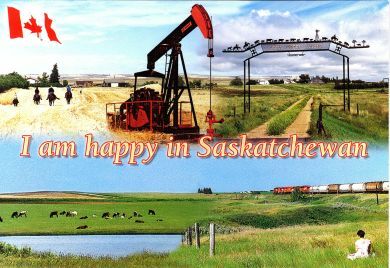 In real good language driven by passion and/or greed, explain to me why you think you should get a Happy in Saskatchewan postcard with a very personalized message from me (and a Hello from Schmutzie?). Consideration will be given to people who write super eloquent and do good diction. 2. Entries must be at least one word and no more than infinity words. If you're going to write a big old essay, please send me a big old email. 3. If you don't really want the Happy postcard, please enter the contest anyway. 4. All entries in verse (because some of you display a taste for haiku) must feature lines that rhyme, but not necessarily with each other. 6. I favour palindromes. Just so you know. 7. Entrants from Saskatchewan will not receive the prize. Instead, they'll get thirty nine cents and directions to the nearest Shoppers Drug Mart, where they can buy their own damn postcard. 8. Contest will close when I go out and buy stamps. And that may be a while.